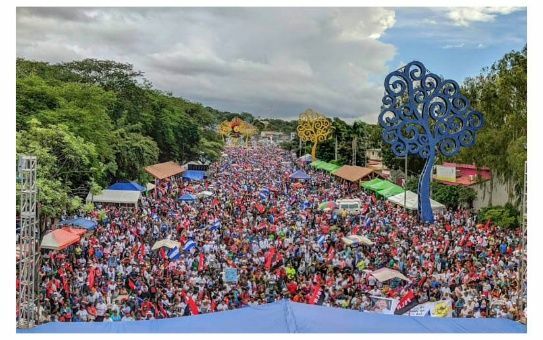 Managua, Sep 5 (Prensa Latina) A protest march for peace and justice for the victims of coup terrorism will be held today by Nicaraguans, convened by the Sandinista National Liberation Front (FSLN). The people are called to march in all the country’s municipalities to demand peace, life and human rights for all after the failed coup that caused 198 deaths, according to government figures. In Managua, the route is scheduled for 3:00 p.m., local time, in the main avenues of the city. ‘Justice for all, We walk with commander #Daniel, We walk for our brothers victims of hate, are some of the messages that appear on social networks in support of the FSLN. The government also promotes love, dialogue and reconciliation among nationals, as the only possible alternative to consolidate the tranquility and stability in the country. Most Nicaraguans demand punishment for criminals and advocate a return to peace and security, interrupted by violent opposition groups that sought to overthrow the government. With this aim, thousands of people made on weekend walks nationwide and a 500-vehicle caravan in the capital.